kawaii!!!. . Images in the Sebastian Michaelis club tagged: sebastian kuroshitsuji michaelis sebby cute adorable cat. 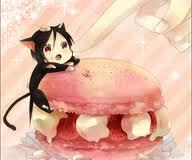 This Sebastian Michaelis icon might contain cupcake and frosted layer cake.